This case study describes the conduct and outcomes of an initial risk assessment of the Sydney Olympic Velodrome, undertaken in 1994 in the early stages of Olympic facilities planning. The intention was to facilitate a short brainstorming session, involving the main Government stakeholders in the development of the velodrome, to provide input to a subsequent value management study. Participants in the process included representatives from Government agencies concerned with sport, Olympic planning, urban planning, architecture, facility construction and venue management. Establishing the context involved an examination of briefing documents to develop an initial structure of 12 topics for the workshop. Other steps in the context-setting process, including the identification of stakeholders and the definition of critical success factors, were incorporated into the workshop itself. The objectives for the velodrome are listed in Table 1. The workshop process involved two phases. In the first phase, the structure and analysis framework was discussed, and the lists of key elements, stakeholders and critical success factors were adjusted to suit the participants’ priorities. The description here reflects the adjustments made during this first phase. The stakeholder with the prime responsibility for managing each risk was noted, where this could be identified. For the first elements from the list of twelve examined in the workshop, an attempt was made to record the individual criteria that might be affected by each risk. However, this did not prove practicable in the time available and so it was not continued for all elements. The impact and likelihood ratings were converted to a risk score for each of the 126 risks identified in the workshop. The risk profile is summarised in Figure 1. The assessment process was undertaken quickly, to meet tight timing requirements. It was recognised that the workshop outcomes would have to be reviewed and extended, to ensure that the best possible use was made of the findings. It was nevertheless seen as an important scoping exercise and a valuable contributor to the initial value management study that would follow, as well as initiating the process of risk management for this facility. Developing a monitoring plan for implementation, as part of the Risk Management Plan. The risk assessment described here was undertaken at an early stage in the velodrome development: only an outline concept was available, a site had been identified but not yet formalised, the procurement strategy had not been agreed, and Sydney had not even been awarded hosting rights for the 2000 Games. Nevertheless, the risk assessment process was valuable. It initiated policy discussions about balancing Olympic requirements and long-term future uses of the velodrome among key stakeholders. An important lesson here is that the risk management process can, and should, start early in the life of a project. The early focus is on strategic and policy matters, when great detail is neither available nor needed; risk assessment at this stage helps to focus subsequent activities on the most important areas of uncertainty, and so assists in shaping the strategic and policy approach that is adopted. There are close links between risk management (RM) and value management (VM), and a form of RM is part of the evaluation phase of the VM process. 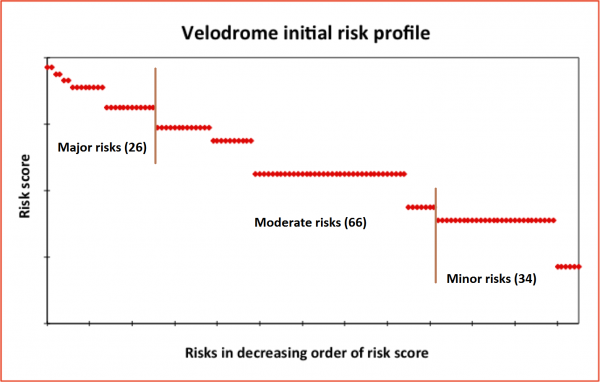 The VM that was proposed for the velodrome was to examine the initial concept options, and the high-level initial risk assessment described here was well suited to this purpose. Shortly after we prepared this case study for our web site, the Australian Olympic Committee announced that Australia's flag bearer at the Opening Ceremony for the 2016 Rio Olympic Games would be Anna Meares, Austraia's most successful track cyclist. Rio will be her fourth Olympic Games. Congratulations and best wishes!